Espinette (aka Ellie) is an affectionate, athletic mare whom we have recently welcomed back to the mare-band. By Hanoverian Stallion of the Year 1995, Espri, she combines jumping talent with expressive movement – possibly attributable to her damsire Woermann, the renowned father of World Cups I to IV, and the dressage-sire Wenzel I. Though Espri blood is widely recognized as prepotent for great legs, athleticism and jumping talent (the Escudo stallions, ET FRH, Enrico etc), Espri is also a producer of upper-level dressage competitors. Esprit de Valdemar (Espri / Woermann) represented Denmark twice at the Olympics, as well as at the World Cup; Nadine Capellmann’s Elvis VA was selected to represent Germany at the 2006 World Equestrian Games and the 2008 Olympics. Espinette was performance tested in Verden as a 3 year old, where she earned 8,7,8 for gaits, 8 and 9 in rideability, and 7s in jumping. In 2009, at 13 years of age, she was inspected again and accepted into the GOV Mainstudbook. Ellie is a substantial mare who looks very much like her sire, with picture-perfect feet, well-muscled frame, and good riding horse points. In 2000 Ellie delivered a beautiful filly by Weltregent (Weltmeyer/Donnerhall/Pik Bube) who was subsequently chosen as Champion Hanoverian Foal at her inspection. In July 2006 Ellie presented us with a tall, splashy, bronze darling by Landkoenig. This striking filly is owned by Robin Wulf, near Cleveland Ohio, and was awaited with much hope and anticipation. 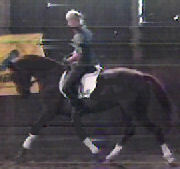 In 2008 Ellie gave us Word of Honour sweet and gentle and easy, he is now a super dressage partner for his amateur owner. In 2009, Shining Bright by Starlight was born, receiving a Premium designation at her GOV Inspection, with comments “Beautiful, beautiful filly … well-muscled, powerhouse filly … bred and built for performance, absolutely correct and very athletic …”. SOLD to USA. 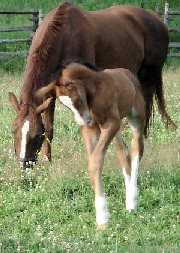 In May 2010, the flashy black brother StarPower was born, and SOLD as a dressage prospect to USA. After 3 years “open”, in 2013 Ellie produced a tall, masculine black colt “Favorite Game” who is very much like his illustrious sire Freestyle by Florestan. SOLD to New Brunswick. For early June 2014, Ellie was bred to the gorgeous Sir Gregory, pictured right, (Sir Donnerhall / Don Gregory), who stole my heart when first I saw him in video. I have been trying for a foal by him ever since. The resulting golden girl fulfilled all expectations, earning the Top Filly title, and Overall Co-Reserve Dressage Champion Award at her large Verband foal inspection. This cross has been repeated. The 2016 foal was aborted late term, but in early May, 2017 we welcomed a bright beautiful Sir Gregory filly “Starlet“, who was sold, in-utero to California. Naturally we bred again to Sir Gregory, but Espinette slipped the foal at 8 months gestation. We are quite bereft; but will ensure a comfortable retirement for our dear girl. RIP little filly.